It has been well documented in the aftermath of last week, being the first week of Baselworld. Never has a watch show been so awash with live streaming, information and hype. I am just here to give my 10 cents to what I think about the new pieces. Yes we have geeked out at the new 3255 calibre which I think is a great step in the right direction for Rolex. A technical tour de force without being overkill. It maintains Rolex as being the ultimate watch brand with a more than adequate workhorse movement that will in time grace many other watch models. More interestingly they have discontinued the Air-King and replaced it with the Oyster Perpetual, available in 5 different case sizes. All to appeal to a broad spectrum of customers. Neatly positioned and sized, even priced, to be seen as a natural everyday piece. But I am not here to concentrate on the above pieces and more besides. The Yachtmaster is why I am here. The live photos I have of this piece are okay, for a watch show the lighting in Baselworld is nothing short of terrible. Anyway, the point is I rather like these pieces. Available in 2 sizes 40mm and 37mm, the case is in Everose gold. The ceramic bezel is not in relief but like the original Yachtmaster has raised numerals and hour markers. Again in a bit of a departure, the numbers are polished and have a sheen to them, whereas the rest of the bezel is matte. This adds to the visibility as the contrast in textures makes the bezel really very interesting to look at. Most noticeable is in fact the rubber / elastomer strap, named the Oysterflex strap. 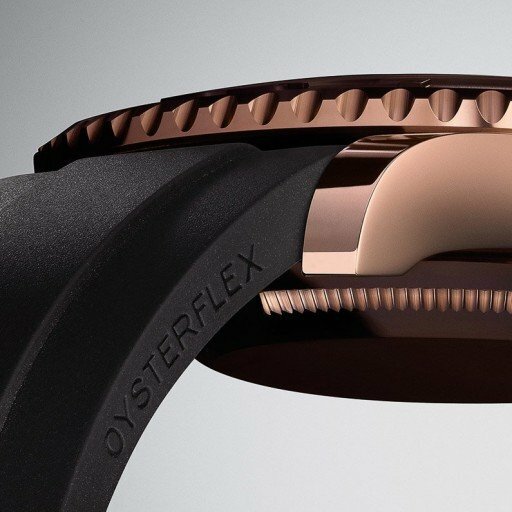 A proprietary rubber strap with a thin strip of titanium within its core to maintain its’ shape and flex. Finally Rolex have listened to their consumers and also what has happened in the aftermarket strap industry. There is another story there with the straps as I recently invested in a piece of the finest American alligator. That is for another time. True to form this watch, in my mind is a great looking watch. It ends there however. No matter how good it looks, there is a big thing missing. Steel. 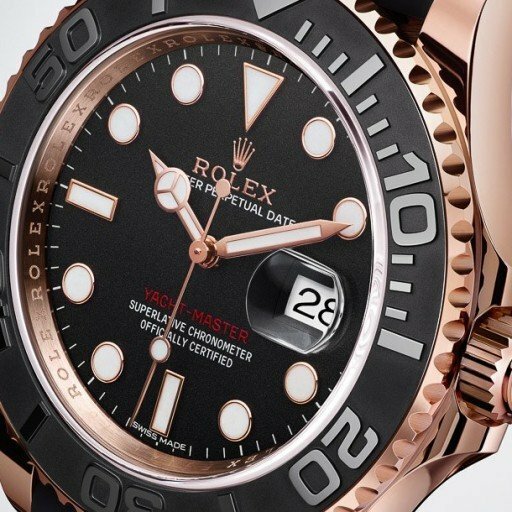 For the second year in a row Rolex have decided to produce a sports watch in a precious metal, why? It has completely baffled me. 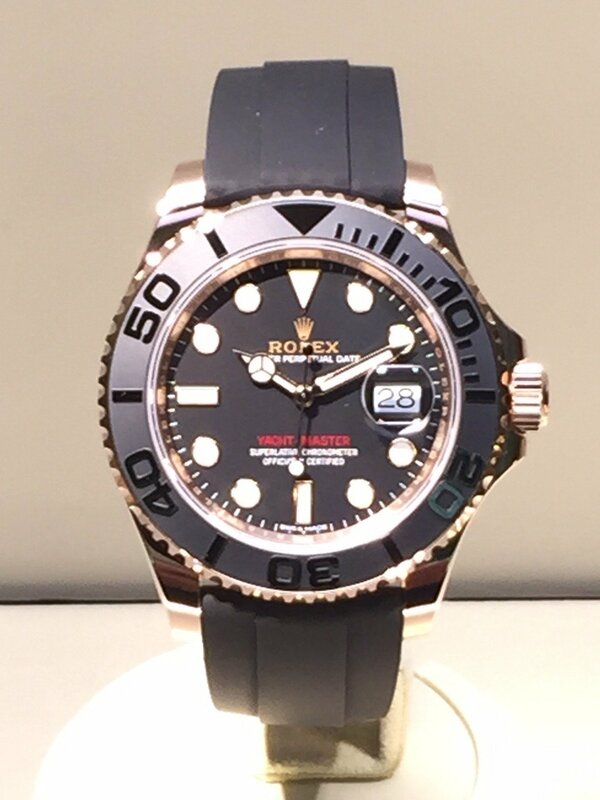 The price point is also huge for what is essentially a modified Submariner in Everose. The 40mm is 23,800CHF and the 37mm is 21,000CHF. Scary to say the least. Price aside, I love this watch and think it is a real concerted effort by Rolex to target a different audience, and to keep its’ hold on the existing customer base.